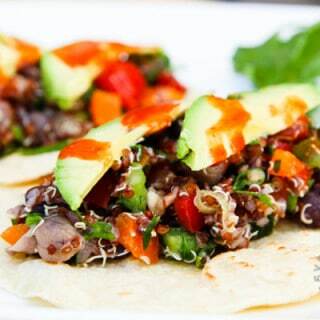 These tacos are all about fresh flavors! Minimal cooking, tons of veggies, and the perfect healthy tacos or salad to take for a potluck, picnic, BBQ, or weeknight dinner! In a large mixing bowl, combine the cooked mixed beans, cooked quinoa, red bell peppers, green bell peppers, orange bell peppers, cherry tomatoes, onions, cilantro, and spinach. Toss with fresh lemon juice and salt. Add freshly ground black pepper to taste. You can serve this dish as a salad or prepare tacos. Follow directions accordingly. Top with some sliced avocado and your favorite hot sauce! Lightly grill both sides of the corn tortilla on a pan using your favorite vegan butter (such as earth balance). Spoon the prepared mixture along the center of the tortilla. Top with sliced avocado and your favorite hot sauce (such as Cholula)! If you don't prefer to cook your own beans, you can easily use canned cooked beans, just be sure to wash them prior to using. Soak the dry beans (black, pinto, garbanzo, & kidney) in a large mixing bowl with water overnight. The beans will soak up some of the water, so be sure to add plenty. Drain the beans, discard the soak water, and rinse with fresh, cool water. Cover the beans with fresh water (just enough to cover them) once more and cook in a pressure cooker.When the steam begins to hiss out of the cooker, reduce the heat to low-medium just enough to maintain a very weak whistle. Cook for an additional 2-3 minutes.Turn off the heat and let the pressure cooker sit until it is safe to open.